This homeowner wanted an extended outdoor living area in order to create their own personal retreat. They purchased the corner lot next to their home and demolished the old, small home that was on the property in order to build their dream backyard retreat. Once the small home that was on the empty lot was demolished, Texas Custom Patios was able to create the new foundation for the outdoor living space. This outdoor living area has all of the necessary items to come outside and stay outside. A full outdoor kitchen, bathroom, fire place, storage closet, and easy access to the game court and swimming pool. 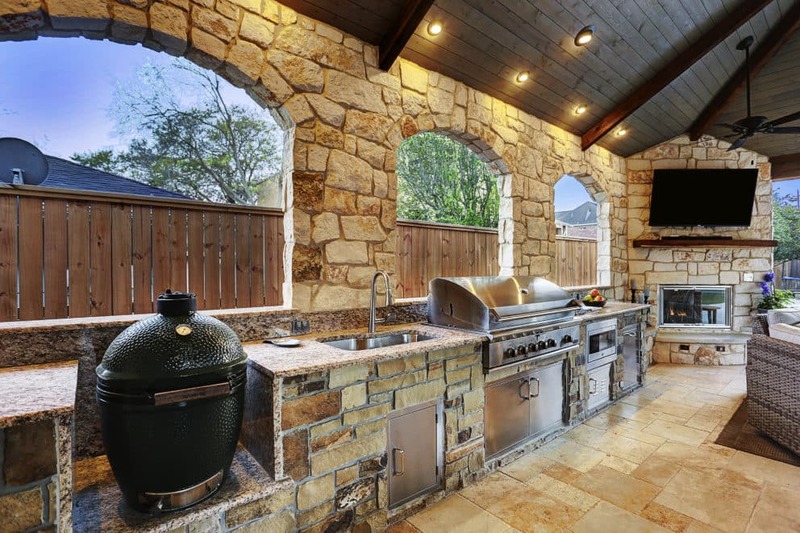 Outdoor Kitchen that has it all! This kitchen is equipped with both a Big Green Egg and large gas grill, a microwave, a sink, plenty of storage and counter space. There is a full size fridge in the storage closet at the end of the space. This large space allows for the family to entertain and enjoy the outdoors. A pool cabana space that enables the kids to enjoy the pool while the parents are close by. The ceiling is a smoky bourbon colored tongue and groove pine that has been trimmed out with cedar beams and columns. The two fire features enable the family to have the best of both — a fire pit to sit around under the stars and a fire place to snuggle up in front of and watch a movie. The carport was built onto the space to provide parking for the kids. The entire space has over 1700 SF of concrete finished in a travertine tile. The covered areas equal about 1200 SF. When standing on the back porch, the homeowner has a great view of their retreat. The outdoor kitchen, arched walls, and fire features are finished in two complementary veneer stones. The electrical work includes coach lights on the columns, recessed can lights on dimmers, ceiling fans to keep the air moving, LED step lights on the hearth and seat walls. This outdoor living area has it all – the pool flows seamlessly to the covered living area and then out to the sport court that was built. The entire yard was landscaped by a company that works hand in hand with Texas Custom Patios.